Arlington County has decided to leave the current Community Canine Area (CCA) rules—which allow children of any age—unchanged. Post additional signs with the rules of use in the CCAs, and highlight the language advising parents to monitor their children at all times. Increase community education and outreach about safety in the CCAs through the website and meetings with CCA sponsoring and user groups. Work with volunteer CCA sponsor groups to help them with onsite issues, and update and post volunteer training materials on the website. Encourage CCA users to report problems by email to PRCR@arlingtonva.us or by phone to 703-2286523. Kudos, too, to Arlington County for showing they will listen to the residents when enough people make their opinions heard. 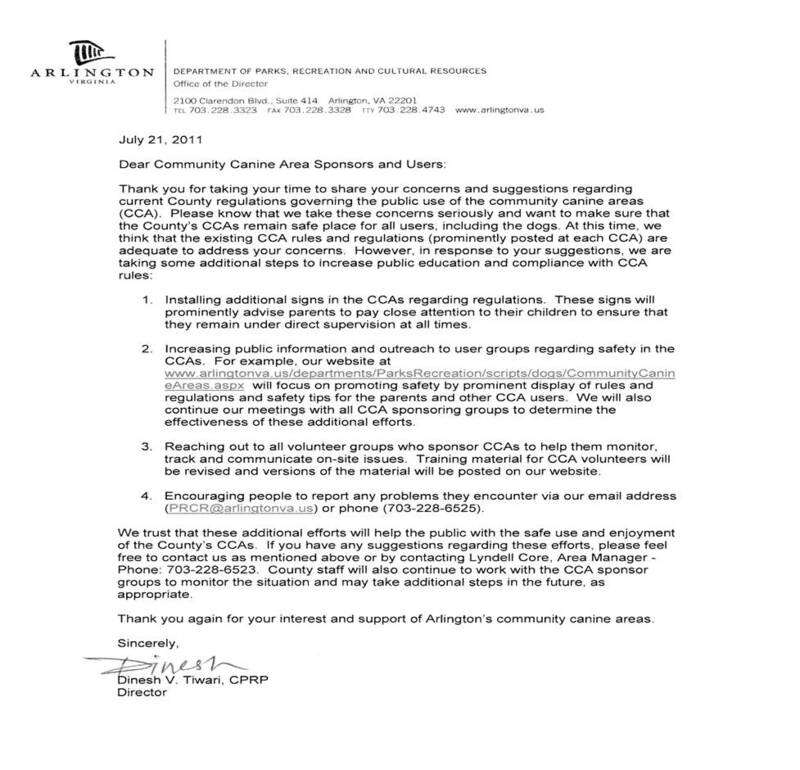 Arlington County’s website currently featured a list of all the Arlington CCAs but not a copy of the letter. And the link to the rules and regulations was broken at the time of this post. Dog parks are dangerous places, especially for children and old people. I don’t think the County should ban either, but in the highly litigious society in which we live, I can understand why they might want to. I’m a 65-year old who was knocked down by two large dogs on a high-speed mission. They were just trying to greet my brother’s Schnoodle, Fletch. No one was at fault. But I was up-ended, broke my tibia at the knee, had to have reconstructive surgery, and spent the last 4 months recovering. It hasn’t been much fun and the medical bills have been astronomical. And needless to say, my health insurance company is looking for someone to pass these costs on to. So there is a practical side to this debate. People need to be made aware of the dangers, if only with signage. I’ve been in dog parks where there are creeks and streams and witnessed children playing in the water where dogs are pooping and peeing. That can’t be very good. Anyone who uses a dog park needs to be made aware of the dangers. Perhaps you should be lobbying for appropriate signage.